Featuring Certified Computer Matched Paint, ABS Blow Molded Construction, Lightweight and Durable. Lifetime Warranty! Know Your Paint Code Before You Order! Determine the PAINT CODE of your vehicle. Look below for help on finding the paint code on your vehicle, and also visit www.paintscratch.com to help find your EXACT paint code. On the PAINT CODE? info box give the PAINT CODE and also the EXACT NAME of your paint before adding to the shopping cart. The BEST professionally painted automotive spoiler you can buy! The final product is lightweight, durable, withstands extreme temperatures, and is O.E.M. certified. Our spoilers are lighter than fiberglass and will not crack or break. The spoiler weighs around 5lbs. Our products are assembled, inspected, and tested by hand in order to insure consistent quality of the highest level. We supply and install spoilers for the largest automotive dealers in the area, with 20 years of experience in the automotive restyling business! All our spoilers come with a Lifetime Warranty on construction, 6 year / 66,000 mile warranty on paint! Can I install the spoiler myself? Yes! We include a deluxe installation kit and step by step instruction sheets. You can also view instructions on our website. How do I use the locator tabs included in the hardware kit that came with my spoiler? The Locator Tabs are the white paper strips that are 8 inches long (they might be attached to each other). Flip the spoiler over so that the feet (posts) of the spoiler are in the air. Take the locator tabs and remove the adhesive backing from the center and punch out the hole in the middle. Match up the holes from the locator tabs with the screw holes on the spoiler and stick the locator tabs around the screw holes of the spoiler horizontally. Flip the spoiler over and position it on the trunk where you would like it. Tape the locator tabs onto the trunk. Remove the spoiler from the trunk. The locator tabs will be taped onto the trunk showing you where to drill the holes. How long does it take to install a spoiler? It depends on which spoiler you are installing. A non-lighted spoiler can take as little as 15 minutes, whereas a lighted spoiler can take up to one hour. The only power tool that you will need is a drill. You should also have something similar to a drop cloth to lay in the trunk. You will need a measuring tape, a punch or its equivalent (screwdriver) and masking tape. We have custom hardware in our installation kits. What is the difference between a OE Style and a Custom Spoiler? An OE Style orfactory look-a-like spoiler is one that looks just like the spoiler that you could buy directly from the dealership. A custom spoiler is one that is made to fit the car, but does not resemble the factory. If you are looking for something with more style or flare to it, a custom spoiler is the way to go. Typically you would pay more for a custom spoiler, but with us you will not pay anything extra. Are spoilers available pre-painted to match my vehicle? Yes! They can be shipped either painted or unpainted. The majority of customers choose the painted spoilers because our paint finish exceeds that of the factory. What information do I need if I want to place an order? I need the following information about your vehicle: year, make, model, and paint color code and exact paint name (if possible). Do I need a light in my spoiler? It depends on where the existing third brake light is located. 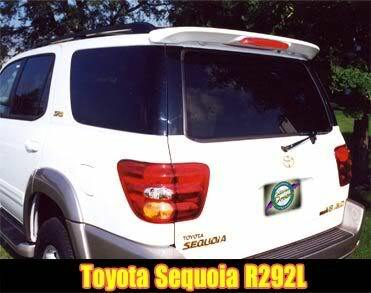 If the existing light is in the lower portion of the rear window, a spoiler would obscure that light, so a lighted spoiler would be required by law. All of our lights are S.A.E. (Society of Automotive Engineers) approved. What material is the spoiler made of? The spoilers are constructed of a blow molded automotive grade plastic (ABS). As a result of this, most spoilers weigh around 5 lbs., so trunk reinforcements are not necessary. The spoilers are also guaranteed for life against splitting, cracking or warping. What types of payment are available? We all major Credit Cards and Paypal, or contact us for other payment options. What types of shipping methods are available? We ship with UPS, FedEx, and the U.S. Post Office. We can also ship overnight when the spoiler is ready, but additional charges will apply and we are not responsible for the exact times of the overnight delivery. What if I receive the spoiler and decide that I don't like it? We use the best pictures available for most vehicles as a representation of the product offered. We back the spoilers we offer with a 6 year / 66,000 mile warranty and both the paint finish and the plastic part itself are guaranteed for life. If, however, you do decide to return a spoiler, we charge a 25% restocking fee on painted and unpainted orders, and also a $50 paint fee on painted orders, and we do not credit shipping charges. Acura On a label inside the driver's door jamb. The code should begin with a letter. BMW Inner strut tower on the driver or passenger side of car. The code should contain three numbers. Cadillac Under the trunk mat on a label. Should be a two-digit code ending in U or a WA number that is four digits long. Chevrolet Under the trunk mat on a label. Should be a two-digit code ending in U or a WA number that is four digits long. Chrysler On a metal tag in the engine bay on the radiator support. The code is three characters. Dodge On a metal tag in the engine bay on the radiator support. The code is three characters. Eagle On a metal tag in the engine bay on the radiator support. The code is three characters. Ford On a label inside the driver's doorjamb. The code should be two digits, normally two letters or a letter and a number. Geo On a metal tag in the engine bay on the firewall. The code should be two digits ending in U or a WA number that is four digits long. Honda On a label inside the driver's door jamb. The code will begin with a letter. Hyundai On a label inside the driver's door jamb. The code will be two digits. Infiniti On a metal tag in the engine bay on the firewall. The code should be three digits, normally two letters and a number. Isuzu On a metal tag in the engine bay on the firewall. The code should be at least two digits long. Lexus On a metal tag in the engine bay on the firewall. The code should be three digits always beginning with a number. Mazda On a metal tag in the engine bay on the firewall. The code should be three digits long. Mercedes On a metal tag in the engine bay on the radiator support. The code should be three numbers. Mitsubishi On a metal tag inside the engine bay on the firewall. The code should be three digits, always starting with a letter. Nissan On a metal tag inside the engine bay on the firewall. The code should be three digits, normally two letters and a number. Plymouth On a metal tag in the engine bay on the radiator support. The code is three characters. Pontiac Under the trunk mat on a label. Should be a two-digit code ending in U or a WA number that is four digits long. Saturn Under the trunk mat on a label. Should be a two-digit code ending in U or a WA number that is four digits long. Subaru On a metal tag in the engine bay on the radiator support. Should be a three-digit code, with the first two digits being numbers (the third may be a number or a letter). Toyota On a metal tag in the engine bay on the firewall. The code should be either three numbers or a number a letter and a number. Volkswagen On a label under the trunk or on the driver's rear wheel well. Code should start with an L" and be four digits long." Volvo On a label under the hood near the driver or passenger strut towers. The code should be three numbers long.